Join the discussion on our forums! 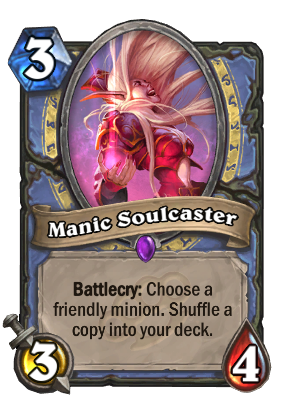 Come discuss Manic Soulcaster over in our dedicated Manic Soulcaster discussion topic. Battlecry: Choose a friendly minion. Shuffle a copy into your deck. When casting a tournament, you really have to put your soul into it! Really good card overall. Wins the late game by reshuffling powerful cards . Anybody try to make this work in a non-Reno deck yet? Control Mage is inferior to Reno Mage,simply because you don't really suffer from inconsistency issues as Mage cause you have a lot of good cards and you get access to Reno and Kazakus which are both insane. So i shuffled only 1 kazakus back in the deck and my reno stopped working, possible bug? Just got a Golden one from my end of season reward chest to complete my reno mage list. :) FeelsGoodMan Happy New Years! This card is really good in Reno decks as predicted, ideally you want to reshuffle Reno Jackson or Kazakus. It has great stats so it is totally ok to throw it on an empty board against aggro decks. The dream is Brann Bronzebeard + Kazakus + Manic Soulcaster on Kazakus. Two potions of your choice and 2 more Kazakus to draw later and delay fatigue. I played a mage that did this. Later on, he played Reno to save himself from lethal, but it didn't activate because he forgot about the 2 Kazakus waiting to be drawn. His turn ended with a "Whoops" and conceded. The card is performing very good in a one of deck. Combos with Reno and Kazakus. 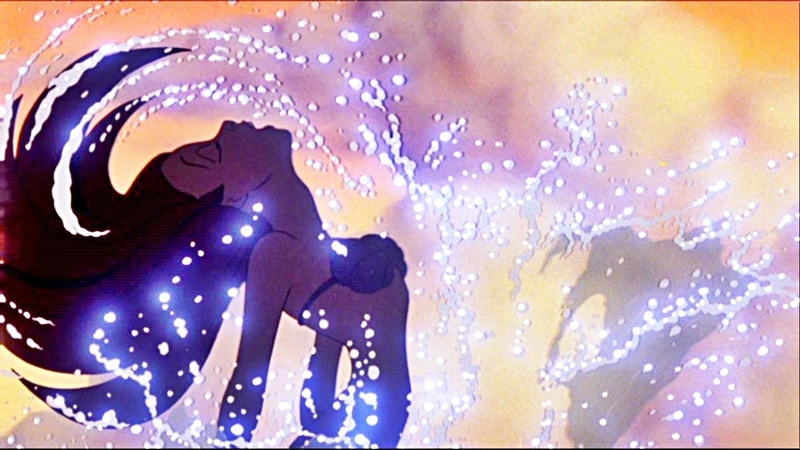 Great stats, great effect, great art! One of the best designed cards. Looks decent in reno mage decks. Since the minion needs to be drawn, you could potentially reshuffle cards like Inkmaster Solia or Reno Jackson himself and even Kazakus! Looks like it will help out with getting late game value too. When played on curve, this will always copy a minion you do not want to draw lategame, so it might be better off copying nothing. As a lategame card, sure, there are combos, but combos=carddraw is needed, and carddraw is not good in fatigue decks. I have problems fitting this anywhere, and the pandas do a better job with double battlecries. People are probably downvoting you because Prince Malchazar has no Battlecry; if he did, then this would be a bug. Remember Battlecry is an ability of certain cards and will have that term printed on them. Also remember Battlecry abilities are triggered by playing a card, not by having it in your deck as is the case with Prince Malchazar and Patches. Maybe this will bring back control mage. Powerful card....so many possibilties....will definitely see it in play. Do you think this will see play in some sort of grind / deathrattle mage deck? Imagen all the deathrattle cards, if you bounce just one back or even N'zorth. It will be huge! Play tons of removal alongside with it! The new potion, double flamestrike, double blizzard. I think such a deck could be pretty strong. Because in the long game having an additional card in your deck can be game winning. Also because when you bounce a minion you're taking it off the board. With this you get to keep it on the board. Plus its a 3 mana 3/4 which is the most well statted bounce minion that mage gets (Except its better than bouncing!) Also worth noting that its only worth bouncing minions with powerful battlecries. With this you could still get value for using it with a different minion.